Carte des Antilles du Golfe due Mexique et d'une partie des Etates voisins. 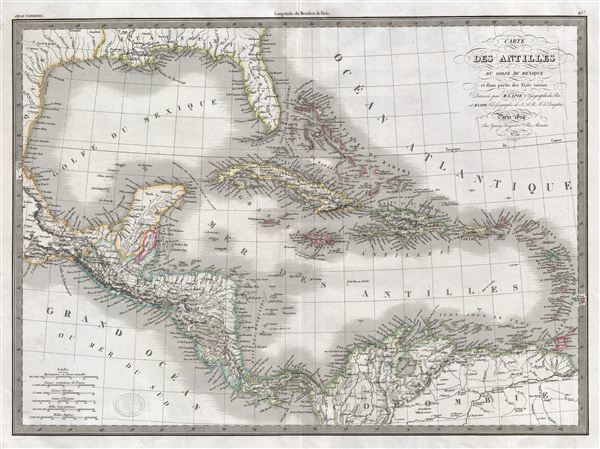 A fine first edition example of M. Lapie's 1829 map of the West Indies. This map covers from the Gulf of Mexico to the Lesser Antilles and from Florida and the Bahamas to the Spanish Main, inclusive of the Greater Antilles, the Caribbean Sea, and Central America. Lapie's map offers fine detail throughout with elevation rendered by hachure and political boundaries demarcated with outline hand color. A stunning map, this example offers typical French decorative elements including elaborate typesetting in the title area. This map was engraved by Armand Joseph Lallemand as plate no. 45 in the first edition of M. Lapie's important Atlas Universel. This map, like all maps from the Atlas Universel features an embossed stamp from the Lapie firm.